Home / The Beatles are Coming! The Beatles are Coming! Well, not The Beatles, but my beetles. My Melissa Shirley Beetle Purse is back from the finishers. I love it. I started this canvas in an embellishment class with Brenda Hart a year or so ago and finally finished it. My favorite part of the stitching is the background. It’s a woven open stitch done in metallic. It goes fast and is easy to compensate. What more could we want. With that plus I could focus on the details in the wonderful beetles. The leather is the perfect shade of olive green. The size is perfect. Who knows, I may even carry this one. Funny thing is, I irrationally hate bugs. I had to have this purse, go figure. I did document all the threads and stitches. A complete stitch guide is available should anyone else want their own Beetle Purse. Look! Silk Ribbon bugs! How cute. Seriously, this is a killer purse. Carry it in good health. Wonderful! You sure have a way of making a silk purse out of a bug's antenna! Or something like that. Ruth this is so grand, and the finishing is perfect. I don't suppose you'd like to trade it for one of my vintage Isabella Fiori's? I didn't think so. Hope you're out and about today carrying your new purse! Fabulous piece. I am sorely tempted to order it, but have another I have to finish first! Hi I am interested in your stitches. How can I get this pattern?! 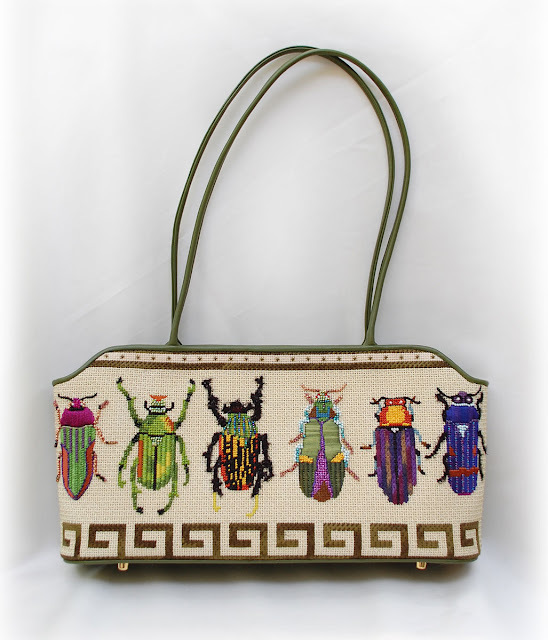 You can order the painted canvas, instructions and threads for the Melissa Shirley beetle purse through our shop. Here's the weblink.